PATUXENT RIVER, Md. --- The Marine Corps’ F/A-18 squadrons recently flew with the Advanced Precision Kill Weapon System (APKWS), a highly accurate 2.75 rocket that provides air-to-ground weapon support. 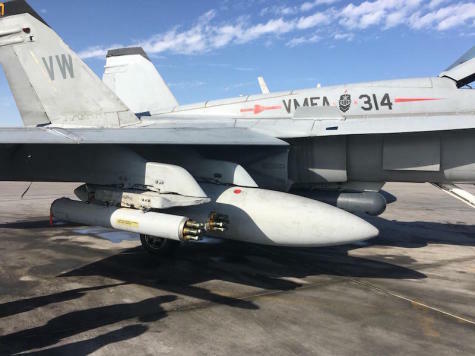 “This is an incredible weapons system that our most experienced pilots down to the newest pilots can effectively employ,” said Lt. Col Jon "TAG" Curtis, commanding officer of one of the F/A-18 squadrons. The F/A-18 is the second Navy fixed-wing platform to carry APKWS. It is also employed from the AV-8B as well as rotary-wing platforms including the UH-1Y, AH-1Z and MH-60S/R. The Navy and Marine Corps have fired thousands of combined fixed- and rotary-wing shots and hundreds in combat scenarios.